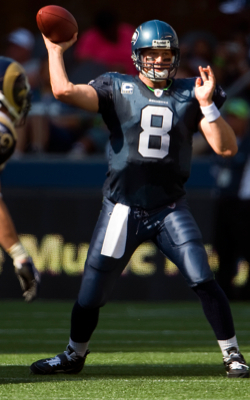 The Seahawks started off the season with a complete shut out against the St. Louis Rams on Sunday September 13th. The game started off with so many turnovers, creating excitement in Seattle. Qwest field was full of noise and held up to its claim as the â€œloudest stadiumâ€ for the most false starts and delayed plays. The Seahawks turned the ball over three times in their first four possessions, which were two Hasselbeck interceptions and a Burleson fumble, also got a 14-point swing when a Rams return of a blocked field goal for a touchdown was nullified because they had 12 men on the field. Victory was sweet for the Seahawks until game two came around against the San Francisco 49ers on Sunday September 20th at the 49ers Candlestick Park stadium. Everything that could go wrong went wrong for the Seachickens, eh hem sorry Seahawks. However, the Seahawks have an extended injury list which did not help them to take on the 49ers Frank Gore, who truly had an amazing game. 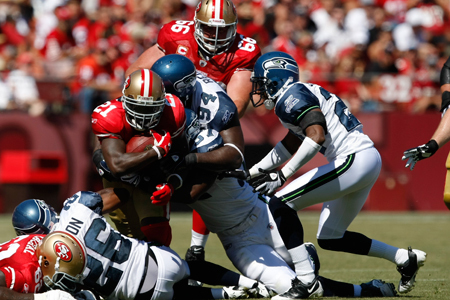 Gore, San Franciscoâ€™s rampaging running back, had 80- and 79-yard touchdown runs as part of his 207-yard outing as the 49ers slapped the Seahawks with a 23-10 loss. Each long run came against a Seahawksâ€™ defense that was stacked in an eight-man front to stop him. Quarterback Matt Hasselbeck suffered another hard blow to his already injured back, he removed himself from the game and is still on the injured list putting the pressure on Seneca Wallace to pull his weight in the next games until he can return. Hopefully the Seahawks can make headway in todayâ€™s game against the Chicago Bears. Get better Hasselbeck and Tatupu!